When is it time for a new pair of trainers? There are so many differing views on when it is the right time to replace your running shoes – and quite right too because it is a totally personal thing. I bought a pair of Adidas Adistar Boosts last August (which I LOVE by the way) – I trained for and ran a half marathon in them and continued running 10+ miles a week. Around April time, my shins started to feel a bit uncomfortable and couldn’t quite work out why – when I first started running I’d battled with shin splints but I’d been running regularly for nearly a year with no problems, so why would it suddenly become an issue? A couple of weeks later, I ran an 8 miler and the next day felt a twinge in my foot, this progressed into being unable to walk on it properly. I rested for a week (by the end of which I was absolutely climbing the walls), tried running and it was still painful – it was at this point I started thinking could it potentially be time for a new pair of trainers. I found it hard to believe it was since they still looked pretty much brand new, but started reading some articles on the internet and when I thought about how many miles I’d run in them (400ish) it was quite possible that the inner structuring/stability/cushioning was worn out. 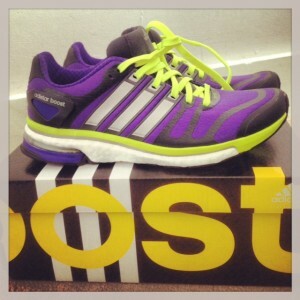 Mind made up – time for a new pair of trainers. I visited the London Marathon Store in Bishopsgate, where I had my gait analysed and tried on a few pairs of shoes. We came to the decision that the Boosts were a good shoe for me; my originals were now the old colour but that meant they were cheaper (bonus!). I had the exact same shoes, just a sparkly new pair! I also bought some Foot Balance custom insoles – I am not 100% sure whether they are benefiting me however after seeing how flimsy the in-built insoles are, I thought it would do no harm having a bit of extra support. For those that live in/visit London, I would definitely recommend going to the London Marathon Store (part of Sweatshop, specialised running retailer); the staff are lovely and knowledgeable and it’s cool to see all the marathon merchandise. Anyway, back to the trainers – I gave myself a bit more rest and started back on the running slowly. When my foot felt better, I went out for a 9 mile run and had no pain – success! Now, I know that the new trainers could have played absolutely no part in the disappearance of my foot pain, however seems a funny coincidence doesn’t it? When is it the right time for a new pair of trainers? 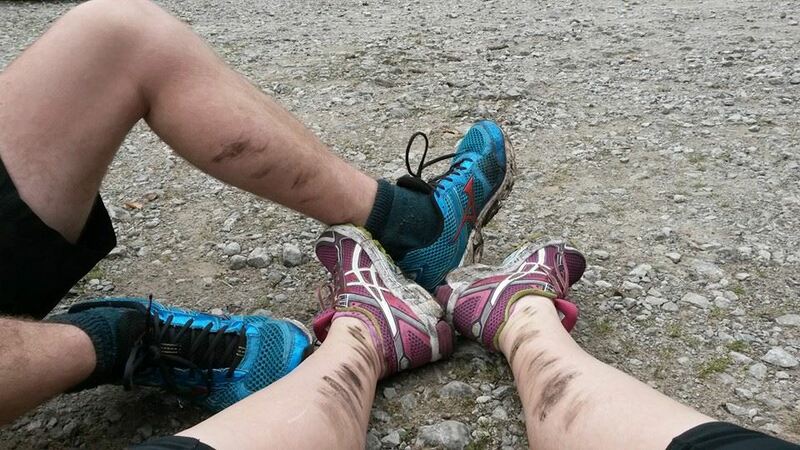 I’d say listen to your body – once you start feeling niggles that have never been there before, it could mean your trainers are beginning to wear (and try to do something about it before it turns into a fully fledged injury!). Combine this with the number of miles you’ve run (they say between 300-500), your running style (heavy footed people will go through trainers much faster) and the terrain you’re running on (tarmac is much less forgiving than trails/grass), and there’s your answer! Another tip would be to have more than one pair, which will mean they last you a bit longer – after all, a girl can never have too many shoes!